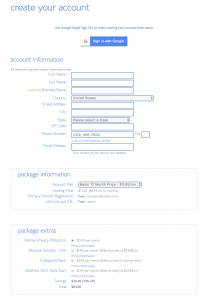 Bluehost has add-on services they offer when you are signing up for a new account. They offer some on the packages page and some on the following pages. I’ve been regularly asked about my opinion on these services, so I thought I would outline what exactly they are and what I personally would suggest. Disclosure: This page contains affiliate links meaning we earn a commission if you use those links. We only recommend brands we use and trust. Also! I have negotiated a lower rate for new customers that join using our signup link – as low as $2.95/month! Packages: Currently shown as Basic / Plus / Choice Plus. All hosts have these pages to sell you on extra features, but it’s hard to know if they’re really worth it. Websites: Unless you have immediate plans to start more than one website, I’d suggest not overpaying for a service you might use sometime. SSD Storage: The space you’ll need to hold all your information online – posts and photos and so on. 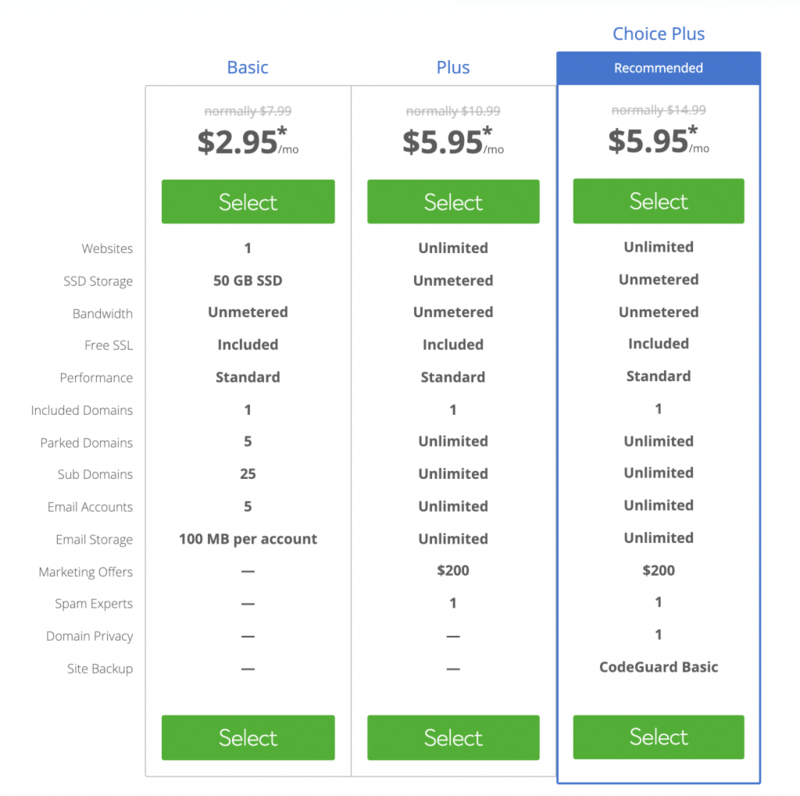 Don’t be sold on hosts offering “unlimited” or “unmetered” storage and bandwidth. Further, unless you already have a site you’re moving, 50GB of storage is A LOT of web storage. We don’t use near that much space on this entire site. Bandwidth: This has to do with how much data is being sent to and from your site – essentially it’s a way to measure website traffic and that’ll be the thing that correlates most with how much bandwidth you need. Again, don’t be too amazed with “unmetered” bandwidth. The truth is if you end up operating a popular site, you’ll need a bigger hosting solution (for a variety of reasons). Any budget host would eventually ask sites sucking down loads of bandwidth to change to a bigger plan. Parked Domains: This feature allows you to purchase another domain and have it pointed to your main one. So maybe if you wanted the .net version of your site to be pointed to your .com site, this could be one way to do it. However, there are free ways to do this with almost any domain registrar. Sub Domains: For use in places where you might want to direct traffic to something like “blog.mysite.com” instead of “mysite.com/blog”. 25 subdomains is more than I use on any of my sites. Email Accounts: A place to host your email. Most sites end up actually hosting email with G Suite (essentially Gmail for Businesses). Or just using a simple Gmail account. The figures on this table wouldn’t be relevant if you use a service like that (and I’d recommend you do). However, the email server option can be a lean and simple way to add an email account to your domain. Email Storage: 100MB isn’t a lot for an email host which is another reason I probably wouldn’t host my email here. The unlimited option of the plus / choice plus packages would likely serve you a bit better. But, again, I’d say move your email to G Suite, which would make this feature irrelevant. Marketing Offers: Usually these are coupons for google/yahoo/bing advertising services. It’s more of a way for those companies to get customers in the door and hopefully get them to spend more. You can get most of these online for free. Spam Experts: This is supposedly some spam filter for email. I’d have a hard time believing it’s better than Google’s (which you get with G Suite or a simple Gmail account). Domain Privacy: This is a valuable service if you are registering a domain at the same time as you’re signing up for hosting, but you can add it as an add-on on the next page. Site Backup: This is also a valuable service, but can be added individually or you can use another service. >>My recommendation: Ok, I think if you read through those descriptions you can see why I’m not swayed that the Plus or Choice Plus packages are worth even the extra $2/month. Further, after your promotional pricing ends (12-60 months, which I’ll outline below), the cost difference will be an extra $7/month. I’d go for the Basic Package. Account Plan: This is where you can sign up for your hosting based on how many months you will prepay. 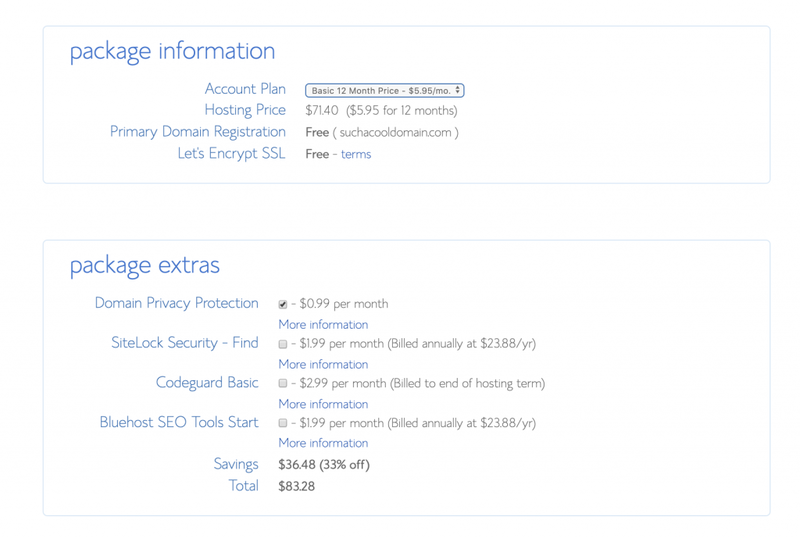 Bluehost offers discounts if you are able to pay more than one year in advance, which can add some long-term savings. Their refund policy is good for 30 days and adjust your refund if you registered a new domain with them (but you do get to keep your domain). The biggest downside to not taking advantage of the longer packages is that after your initial signup period ends, you’ll go to the standard rate (currently $7.95). >>My recommendation: Although saving money is great, paying ~$46-$117 in advance to save $24 is almost not worth it. Since you will probably want to reevaluate your situation in a year anyway, I would only pay for 12 months of service. However, again be warned the rate will go up at the end of this period. Domain Privacy Protection: Whenever you register a website, your information is added to a public database that keeps the registered user information (contact name, address, email address, etc.) for all websites. Generally referred to as the “WHOIS database.” Domain privacy places the privacy company’s information out there instead of yours. I use domain privacy, but don’t think this equates to total privacy. The biggest reason I like domain privacy is that it does help limit spam and junk mail. Note, however, this does not keep people from contacting you or connecting with you if you place your information on your website itself. It’s merely protecting these public records from having your information. >>My recommendation: I’d purchase this service. SiteLock Security: This service apparently verifies your email address, phone, and address. If you are not selling something or offering a service on your site, I can’t see why this would be necessary. Even if you are, there are many better services for demonstrating your credibility. >>My recommendation: Do not purchase. Codeguard Basic: This service offers to provide site backups and restore your site automatically. It offers a one-click restore and the ability to download a compressed file of your website resources. I haven’t used this service, but do strongly recommend a backup option. There are some good plugins that allow you to automatically backup your site and send it to another secure storage (email, dropbox, amazon, etc.) and that is what I have used. It’s also possible to backup your site for free manually, albeit more complicated (see WordPress Backups). I’d guess there is nothing wrong with this service, but I usually like to have my backups going to a separate service to make sure they are safe if there was some issue with my hosting provider. >>My recommendation: I could go either way on this service. It is tempting since it is only $2.99 a month. Regardless, I’d say you do need a backup option. Not having one is the equivalent of your laptop crashing right before you printed off your term paper. Ultimately, I would probably go with an off-site solution such as ManageWP. That will cost you $2/month and give a little extra security. But either way is fine. Bluehost SEO Tools Start: The vague description suggests that this service will get you on google, yahoo, and bing right away. However, you’re going to get many of those capabilities just by installing wordpress. I cannot see how it is worth $1.99, much less paying that amount as an monthly fee. >>My recommendation: Do not purchase. Start using Google Webmaster Tools (for free!) and probably do 10x what they could. Hope this helps clear some of the confusion! More questions? Checkout all my resources here! Hey, I'm John! I manage the technical side of Minimalist Baker and write most of our blogger resources. Checkout all our resource videos on youtube! Thanks for this info. Very helpful! Do you have any recommendations regarding the additional options they offer on the next page? Thanks for clarifying this for all of us. A lot of these upsells at the checkout are always confusing, but I felt that the “Search engine jump start” on Bluehost for an additional $14/year was one of the more vague ones. Thank you SO MUCH for doing a post on this. I was looking into getting my blog started h0wever was entirely confused on what services to get. You have saved me an incredible amount of money. Hi..Thanks for this information. really helpful great post. Actually I’m looking forward to bluehost services and was confused which I should choose in plan and what I should ‘not’. Thanks to you my doubts are clear now. Hey thanks. This was incredibly helpful. Thanks, this was very helpful. Much appreciated. Thanks John! You gave me the information I was looking for. I’ll be back for sure! Thanks for all of your amazing tips. What is the best way to transfer an existing site on wordpress.com to wordpress.org? Any tips would be appreciated! Love your site. I just wanted to say thanks and let you know how helpful this post still is. I’m in the process of a site migration and I’m using a different hosting company, but all the info applies. Thanks for helping me determine what all of these extras mean and make the decision as to whether I need them. Much appreciated. Thanks! That definitely has changed. I’d still recommend them, but I’ll update my notes. Thanks heaps for your tutorials, just brilliant. I signed up with blue host and registered my domain name through them. Wanted to let you know that they charge $11.99 for the domain name registration, it was not free. Perhaps they’ve updated fees. Thanks John for this short to-the-point post. I was just registering a domain for the first time with them. This post definitely help cleared up some questions i had regarding the options. Hey man, I’m looking to take the next step from wordpress.com to wordpress.org and looking for a good host. This was really helpful and I’m glad I found you! Besides Bluehost do you have any recommendations for me? Which host do you use? I agree with what so ever you mentioned above, comparing to godaddy, “blue host” is better and I think when it comes to word press they do better am i right? Great post! Thank you so much!! This information was incredibly helpful. I’m trying to move my website from weebly to wordpress. I wish I had read this before getting the jumpstart – but at least I found the rest of the process of getting a self hosted blog through Bluehost to be pretty easy and afforable. This is great information for me. Thanks alot for clearing all these up. Very useful information. This is confusing for beginners. Thanks! Thanks Sarah! I know how frustrating signing up for service like this can be, so I hope this cleared some of the confusion.